Consumers are using e-readers, smartphones, and tablets with increasing frequency. Simultaneously, magazine and newspaper publishers are rushing to keep up with declining print sales and burgeoning technology to offer digital editions on these devices. The iPad alone has changed the face of magazine publishing since its launch a few months ago. Numerous magazines now have accompanying iPad apps, such as Time Magazine, GQ, Vanity Fair, and more than 40 publications from Rodale. iPad has also helped IDG’s Macworld and PCWorld increase downloads of their digital editions, which have been around for years. The two publications averaged 600 monthly downloads together, but iPad versions are now generating a combined 8,000 monthly downloads. Chris Anderson of Wired predicts that iPad versions of his magazine will soon outsell its print editions. The application will use readers’ individual food and cooking interests to shape their experience. 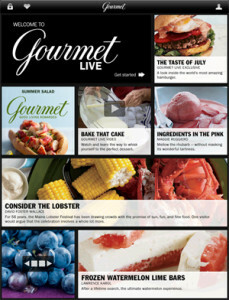 A novel component of Gourmet Live will be its ‘gameplay’ approach of selecting and pushing content to the user. The application features real-time curation, meaning that it will constantly modify its content in response to the user’s preferences, information, current location, past experience in the application, and so on. Other companies are offering standalone digital companions rather than duplicates of or replacements for the print issues. In June, Interweave released Quilting Arts in Stitches, a companion to Quilting Arts Magazine. The company is calling it an eMag™, and describes it as a “much more immersive experience” than traditional e-books or digital magazine editions — part magazine, part workshop, and part video. The eMag is software — compatible with both PC and Mac — that is downloaded to a computer (roughly 320MB) and installed. It’s built using Adobe InDesign and Adobe Flash CS5 Professional, with a custom digital viewer that runs on the Adobe AIR platform. Quilting Arts in Stitches costs $14.97 in Interweave’s online store, compared with a $7.99 cover price for a typical monthly issue of Quilting Arts Magazine. It has sold “a few thousand” copies in its first weeks, according to Interweave, who plans to launch three more eMags from its more than 40 consumer art and craft magazines that focus on knitting, specialty fiber and jewelry-making. All in all, the eMag contains a full hour of assorted video content, ten articles with seven full tutorials, one studio tour, nine artist profiles, four downloadable PDF projects, and five ‘reader challenge’ creativity prompts. And it’s all presented with a beautiful user interface that lets you skip to any point in the content, page or scroll, and zoom in and out on any page. Content — Don’t overuse multimedia to the extent it decreases actual content. Don’t let the bells and whistles overshadow good, old-fashioned text. Also make sure that the text is easily legible, and offer a text-only view. Navigation — Keep navigation simple and consistent with other reading experiences, including traditional print media. Advertising — Ads that take full advantage of the interactive features of digital editions will make advertisers the happiest. Ubiquity — Don’t limit your publication to a single platform, e.g., the iPad. Technology is changing, and the market will be even more saturated with devices for consumers to use to access your content. Screen captures of Quilting Arts in Stitches eMag and Gourmet Live application used under Fair Use: Reporting.